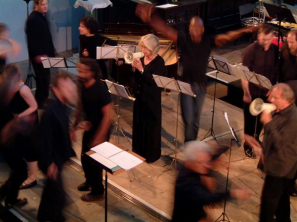 COMA London is an ensemble of strings, woodwind, brass, piano and percussion. The players are of mixed ability, some of a very high standard. There is a very friendly, supportive atmosphere, and we welcome new members on any instrument. We are a mixed ability ensemble ranging from intermediate to graduate level players. Our aim is to play music of high quality which is accessible to amateur players, whether it is written by established composers, students or COMA members. We work towards concerts – about four concerts a year – and often work directly with the composers. Recently, as part of CoMA’s Open Score project, we have collaborated with composition students from the Royal Academy of Music who wrote pieces for us. We sometimes have evenings when members have the opportunity to try out their own compositional ideas with the ensemble. We have performed at many festivals around the country, including Spitalfields Festival for seven consecutive years, and the bmic Cutting Edge series for three consecutive years. All players are required to be Friends of CoMA, and pay subscriptions to cover costs of rehearsals and concerts. We normally rehearse on Tuesday evenings at St Leonard’s Church, Shoreditch (and occasionally at St Dunstan’s Church, Stepney). We welcome all instruments at intermediate to graduate level at the start of each project. Our next project starts on Tuesday 30 April and we will be rehearsing for concerts in London on Tuesday 9 July and in Hay-on-Wye on Saturday 13 July. Contact Richard Gartner on london@coma.org for more information about the ensemble. CoMA London with Children of Hay as part of a weekend of music in Hay.